By Gregory Boyle. Simon & Schuster, 2017. 224 pages. $26/hardcover; $16/paperback (available in September); $13.99/eBook. Five years ago I began my current role as director of social action at a Catholic school, which I have unabashedly described as my dream job. It is often surprising for people to hear that my Quaker spirituality has developed more through my work in this context than it has at any other period of my life. Spiritual leaders like Father Gregory Boyle are a significant factor in that growth. Fr. 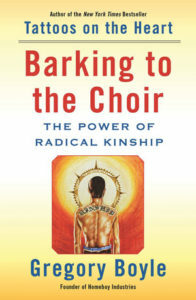 Boyle is the founder of Homeboy Industries in Los Angeles, which, according to its website, is “one of the largest, most comprehensive and most successful gang intervention, rehabilitation and re‐entry programs in the country.” In his newest book, Barking to the Choir: The Power of Radical Kinship, Boyle shares life lessons that could just as easily be voiced in a meeting for worship as in a homily. Because his ministry is rooted in working with gang members, most of his messages come from his encounters with that community. He shares each significant revelation as a focused chapter, with chapter titles often coming directly from his conversations with the “homies” that make‐up Homeboy Industries. The homies often craft their own versions of common sayings, and the book’s title comes from a homie telling Fr. Boyle that he was “barking to the choir.” Boyle sees that of God in anyone and everyone, and lights a way for his readers to do the same. Barking to the Choir’s call to kinship could help guide the work that Quaker meetings across the country are doing to consider how to live into our vision of being genuinely inclusive communities. Centuries ago William Penn stated, “Let us then try what love will do.” In Barking to the Choir, Boyle extensively considers the power of love, which he believes “drives out all fear” and “gets fists to open.” He does not only speak in broad theories, but gives specific advice, such as listening to others, sharing kindness, and being non‐judgmental. For each point he makes, he offers at least one story of a person who has modeled it. My favorite is the story of a man in prison who had been humiliated by a guard and did not respond. When another prisoner asked him why he didn’t speak up, he said he didn’t want to provoke the guard who was on his way home to his wife and kids, on whom he might subsequently take out his anger. Boyle reflects that this man’s “effort was never really about perfecting himself or becoming a ‘good’ person. It was about making his already‐good love more perfect and real.” Throughout the book Boyle utilizes stories like this to illuminate the light of God that we all have within us and the extent to which we lose out when we do not open ourselves up to that of God in those who are different from us.